Our 2 Bottle Wine Dispenser makes it easy to serve and preserve two open bottles of red or white wine. With straightforward push button controls, you can easily pour a perfect glass of chilled wine at the touch of a button. Our 2 Bottle Wine Dispenser is perfect for restaurants and clubs as it preserves open wine bottles for several weeks or would be a welcome addition to any wine connoisseur’s home. Store and dispense up to 4 bottles of wine in the perfect environment . 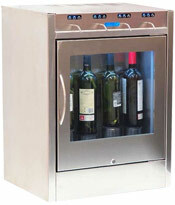 Easy to use push button controls dispense wine in perfect servings—no more guessing or measuring! 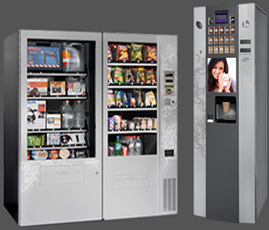 A climate controlled system keeps the dispenser’s contents perfectly chilled while SmartGlass technology provides additional insulation. An ultra quiet fan allows the dispenser to operate practically unnoticed. Argon or nitrogen gas preserves open bottles without affecting the taste, allowing you to open bottles without worrying about waste. This stylish and simple dispenser has 7 different interior light colors options, making it an eye catching and fun addition to any room. This affordable dispenser is a must have for restaurants, wine bars, vineyards, country clubs, or even a home bar or wine cellar—anywhere wine is served!